Recently I received an email from an OLPC supporter who runs an elementary school in the developing world. The school leader is trying to buy 200 XO laptops for students in this school and is looking for guidance on the purchase. XO laptops would be shipped in "approximately 3 months"
Do you think that given the current situation with OLPC, will the laptops be actually shipped "approximately 3 months after payment" or should i expect that to be a lot more? Do you think this program could be a way too big risk at this time? Have you got any information on a successful or unsuccessful "give many" programs? In other words... should I be worried? OLPC is trying very hard to be responsive to orders. Yet for any transaction of this size, I would recommend that you have Term Sheet that specifies exactly what you expect of OLPC and Brightstar. That means shipping dates, logistics, laptop amounts, the software/hardware you expect with it, any support you expect from OLPC, and a payment plan that gives you leverage if something goes wrong (ie: the last payment is made 30 days after receipt of the laptops). A few emails should not replace a term sheet. I also strongly suggested that the school conduct a Total Cost of Ownership analysis for the purchase. Hardware is usually only 10-20% of the total cost of any technology installation. It could even be less if they are going to adapt curriculum to integrate the laptops into the country's educational pedagogy. But maybe my advice wasn't enough. Maybe you might have an idea or suggestion you want to share for this OLPC buyer and anyone else contemplating a Give Many XO laptop purchase. Maybe you'll even be brave enough to tell us about it. i think in this case this TCO estimate (5 x $60,000) is too pessimistic. I am just impressed that you can now buy them for programs here in the USA. If this was available in Sept/Oct I would've purchased them instead of the eee pc for my pilot tutoring program. I would be more interested in hearing from the school on how they are planning to implement their use. If they are successful then this could benefit the community as a whole. Wayan - If it helps you can put the school in touch with me. What I realize that they are for a developing nation and not for use in the USA... worded that wrong. I am still interested in what other resources they have or will be adding to implement it. The Give Many program is for rich people to buy laptops for poor schools. If the school is paying for the laptops themselves, why would they be using the Give Many program? Tell them to get in touch with OLPC directly, why are you taking on middleman duties? http://wiki.laptop.org/go/Portal:Education might be a good place for them to start. The school spoke to OLPC directly, who sent them to Brightstar, which gave them the Give Many pricing. They are communicating direct with OLPC/Brightstar. They only asked me for guidance. I may be many things, but not a middleman for OLPC. I followed the wiki link to the Education page which has a long section on Educator's Workshops. I've just heard that the workshops at OLPC Cambridge are on hold for a while. Not sure why or for how long. The reasons why the elementary school was directed to the Give Many program is because the order is too small in OLPC's eyes for them to deal with directly. Also, the school is directly trying to get them, instead of the national government of that country. The supporter in question should really try appealing to his government's educational department and try and set the school up as a pilot program for a possible nationwide OLPC program. If the national education department expresses interest in testing the XO, I think OLPC will be much more forthcoming in direct communication and support. My understanding, from way back when OLPC was being developed, was that they (OLPC Foundation) would only deal with governments rather than individual schools. The best thing for this school to do is to try to contact the foundation directly (but good luck with that because I've had no luck whatsoever) and find out if they have changed this model of working. I sure hope the person has played with an XO before putting up that much money. Just reading about here and on the official site is not enough. I bought before I had played with a model for more than a minute, and I'm glad I did. It was not enough time to make a decision about a big buy, but okay for the g1/g1 program. Thanks Wayan for posting this! And thanks everyone for input! To Alan: OLPC insists that we talk directly to brightstar, as posted by Jay G. The foundation simply won't take our call. On governments.. well... eh... we've been trying to take to people on government and have said to them "we'll be a pilot for the country, we'll cover the expenses for the pilot project on our school we just need that you guys take note on our pilot and express interest on possibly extending on OLPC and taking on talks with OLPC" the answer has been... procrastination! still working on that though. But to be honest we as third world citizens, have learned not to expect much for governments. At this time we probably have a better shot a getting help from the municipality. 1. Do you think that given the current situation with OLPC, will the laptops be actually shipped "approximately 3 months after payment" or should i expect that to be a lot more? 2. Do you think this program could be a way too big risk at this time? 3. Have you got any information on a successful or unsuccessful "give many" programs? 4. In other words... should I be worried? 1) Is the OLPC Foundation really in a state where they can afford to turn away ANYBODY interested in buying into the project? I understand that their intent is to focus on large-scale deployments through government ministries, but why ignore private organizations? Why ignore small-scale deployments -- even those that receive government funding? Why give anyone reason to consider a Classmate or EeePC deployment instead? 2) Why does the cost per laptop vary based on the number of laptops purchased? The last figure I heard for the cost of materials and assembly for the XO-1 was around US$180. With the weak dollar, I could see it being $200 now. What justifies the 50% markup being quoted for an order of 100-999 laptops? Who is that extra money going to? It's good to hear you were one step ahead of me and were already communicating with the government. Procrastination is, sadly, the way most governments tend to work. However, even if you go ahead with the Give Many, I hope you don't stop with your attempts with the government. If you treat your school as a de-facto pilot program for the nation and keep the government informed, perhaps they'll eventually get interested in an "official" program. 1) Three months time seems reasonable. I think the majority of G1G1 donors got their XOs within that time period. 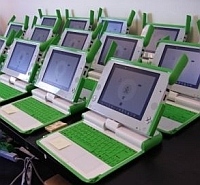 The G1G1 program also was started just at the start of production on the XOs, and was so successful that OLPC was clearly overwhelmed. Now with G1G1 largely out of the way, and with the XOs being in production for months now, that time frame doesn't appear to be unfeasible. 2) I'm not sure what you mean by "risk." All accounts of the XOs seem to be that the hardware is incredibly well put together, so I don't think you're running a risk in getting defective hardware. The OS isn't completely there, although in 3 months at least the Update.1 build should be out and it'll be improved functionality. The OS seems to be where most people are hitting glitches, so it's not a huge "risk" to get the machine as long as you realize they may need updating along the way. 3) I've done google searches, but can't find anything on a Give Many program in progress, neither good nor bad news. It's not too surprising, since not too many people/associations have $30,000 just lying around. If it's not urgent that you get the XOs in three months (like say by the start of a semester), you could hold off and wait for others to take the plunge first. 4) You're about to plunge $60,000 of your school's limited finances into a relatively new form of technology, of course you should be worried. That doesn't mean you shouldn't do it though. But you should certainly think it over and plan it out. Asking for advice here is a good start, but I honestly don't know how many solid answers you'll get from viewers here; we're mostly in the same boat as you are in terms of information. I will say that if you haven't gotten your hands on at least one XO by now, you should certainly look into buying, or at least borrowing, one and testing it out yourself, as well as letting the teachers and staff that will be expected to implement this new device into their classrooms to mess with it a bit too. 1) While the OLPC certainly wants more customers, they really aren't structured at the moment to handle the small-sized orders (say under 10,000) that the Give Many program was designed for. We all saw how overwhelmed they were with the G1G1 program. A small number of clients making extremely large orders is their current structure and goal. Addressing smaller orders directly would increase sales, but would also exponentially increase time and labor costs, while dramatically decreasing their productivity (in terms of time and labor to # of units sold). So Cesar's order of $60,000 would get him his 200 XOs, while the OLPC would have the money for an additional 100 XOs to distribute as they wish. The Give Many program, at least in the sub-10,000 orders, is similar to the G1G1 program in that it was a solution that made it "worth their while" to deal with such small orders. Keep in mind that OLPC is a non-profit determined to not make money off the XO, so any extra money given to them is going to go somehow towards distributing more XOs. "But to be honest we as third world citizens, have learned not to expect much for governments. At this time we probably have a better shot a getting help from the municipality." Well, that would not be at all unusual, to be honest. At least when it comes to education delivery in the "developing world", of which I have some experience. I've actually been wondering for sometime whether the plan to work through governments was a good one for an organisation just starting out. Besides, given the very small # of countries which are green in the OLPC map (http://wiki.laptop.org/go/OLPC_Status_by_Country) it just goes to show the depth of their problems at getting these out to market, IMHO. Note that OLPC has recently put up a OLPC Deployment Guide on the wiki (http://wiki.laptop.org/go/Deployment_Guide) but I don't know if that will be of any help to you.